Renault Trucks’ Long Haul T earns top gong at Hanover Show but Volvo group says Renaults won’t be seen in Australia. A jury of 25 journalists voted the Renault T the International Truck of the Year. The Renault Trucks T has been crowned International Truck of the Year, but the plaudit hasn’t had much publicity in Australia. That’s probably because you can’t buy one here, and won’t be able to. Late last month the T was voted International Truck of the Year 2015 by a jury of 25 journalists from the international commercial vehicle trade press. The award is based on several criteria including technological innovations, comfort, safety, fuel economy, environmental footprint and total cost of ownership. "One year ago, Renault Trucks entered a whole new era with the launch of an entirely new range," Blin says. "This award is the best possible way of highlighting the new Renault Trucks identity." On its British website, Renault says the Long Haul Range T offers "5 per cent fuel saving compared to the previous generation", with various deflectors, fairings and aerodynamics, including an inclined windscreen and a cab which is narrower at the back than the front. There is a choice of an 11 litre DTI engine with power as low as 380hp (280kW) or a 13-litre DTI engine pushing out up to 520hp (382kW) with 2,550Nm of torque. The Euro 6 motors use selective catalytic reduction (SCR) and a particulate filter. An ‘Optidriver’ 12-speed automated manual gearbox is standard, with the choice of manual. Safey features include disc brakes as standard, cornering lights, adaptive cruise control, frontal collision warning, lane departure warning and automatic electric parking brake when the truck stops. Renault is owned by the Volvo group, which also includes Mack and UD, but despite the Hanover show win, the Renault T won’t be seen in Australia. You still see the occasional old Renault prime mover in Australia with a Mack badge stuck on it, but Volvo president for Asia Oceania sales Christophe Martin says it won’t be happening again. Martin says neither would Renaults come to Australia in their own right. "We have with the three brands we sell and serve…I think we have the right pattern for what is needed in Australia," he says. 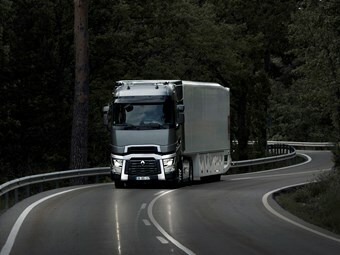 Indeed, the Renault T looks fairly similar to the new Volvo FH and has many similar features.